FAMED BRITISH NATURALIST Sir David Attenborough has issued a dramatic appeal to world leaders to take the threat of global warming seriously. 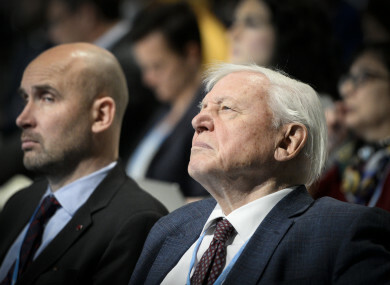 Speaking at the opening of the UN climate conference in Poland, Attenborough said the “collapse of our civilizations and the extinction of much of the natural world is on the horizons” if no urgent action is taken against global warming. The UN chief chided countries, particularly those most responsible for greenhouse gas emissions, for failing to do enough to back the 2015 Paris climate accord, which set a goal of keeping global warming well below 2 degrees Celsius — ideally 1.5 degrees C— by the end of the century. Citing a recent scientific report on the dire consequences of letting average global temperatures rise beyond 1.5 degrees, Guterres urged countries to cut their emissions 45% from 2010 levels by 2030 and aim for net zero emissions by 2050. A 15-year-old Swedish activist who takes time out of school to highlight the danger of global warming echoed his appeal. Greta Thunberg said world leaders who skip the climate summit are “very irresponsible”. Thunberg, who protests outside Sweden’s parliament each week and has inspired students in other countries, said absent leaders such as US President Donald Trump and German Chancellor Angela Merkel “don’t realize how much power they have”. Guterres called for a “huge increase in ambitions” during the negotiations in Poland, adding “we cannot afford to fail in Katowice”. “America is more than just Washington or one leader,” he said, adding that he wished he could travel back in time — like the cyborg he portrayed in The Terminator— to stop fossil fuels from being used. Duda, the Polish leader, said participants at the conference have backed his country’s proposal that governments should insure a “just transition” for workers in fossil fuel industries who stand to their jobs as the world shifts to renewable energy. Email “David Attenborough:'The collapse of our civilisation is on the horizon' ”. Feedback on “David Attenborough:'The collapse of our civilisation is on the horizon' ”.